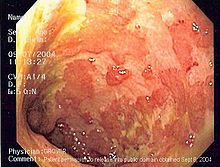 Ulcerative colitis symptoms include: diarrhea, bloody stool, fatigue, abdominal pain or cramping after eating or at night time, recurrent periods of illness, fever, malaise, mucus in stool, hemorrhoids, pus, gas, bloating, incomplete emptying, constipation, vomiting, tenesmus, bowel movements at night, toxic dilatation of the colon, severe inflammation in the colon, massive bleeding, skin lesions, weight loss, appetite loss, night sweats, dehydration, tachycardia, 10-20 liquid stools per day, anemia, poor energy. Children experience similar symptoms along with growth problems and a reduced quality of life. Studies show that food allergies, depression, poor eating habits, and stress worsen ulcerative colitis symptoms. The cause of colitis is unknown but there has been speculation for decades about infectious agents such as bacteria. Other possible causes include the use of antibiotics which kill good bacteria in our gastrointestinal tract and allow harmful yeast and bacteria to come in. People with Candida albicans or yeast infection symptoms also have an overabundance of yeast fungus in their gut. Depending on the severity of ulcerative colits symptoms, a person could be hospitalized several times a year for 7 days or more. They normally take anti-inflammatory drugs that cause side-effects such as a burning sensation in the intestinal tract, a swollen face, anxiety, weight gain, depression, and joint pain. Some people may also feel stressed about leaving home because a bathroom may not be nearby. 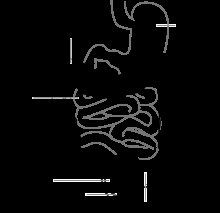 The severity of a persons symptoms ranges from mild (fewer than 4 bowel movements daily with minimal cramping), moderate (4-8 bloody bowel movements daily), severe (8 or more bowel movements daily with anemia, fever, other symptoms), fulminant (10 or more bowel movements daily with severe abdominal pain, other symptoms). Keep a daily journal of what you eat and what ulcerative colitis symptoms you experience. Most colitis sufferers are lactose intolerant and can not tolerate dairy products. Corn, excess fats and oils, tomatoes, spicy foods, wheat products, eggs, nuts, citrus fruits, chocolate, and caffeine often cause problems for people with colitis. Also raw fruits and vegetables such as apples, broccoli and cauliflower may be problem foods. If you are having pain or flare-ups try eating foods that are easy to digest like baby food, also put steamed vegetables through a blender for easy digestion. Also, drink plenty of water to wash out particles that may be caught in the colon, which cause pain.